To help Councilwoman Kepert continue her outstanding work on behalf of the residents of Brookhaven click the Donate button, its quick and easy, and thank you! Fight them. Beat them. Join them. Reform them. Such is the trajectory of council member Connie Kepert's career as a crusading grassroots-advocate-turned-elected-official in Brookhaven, the huge municipality that stretches across Suffolk County, Long Island. Powering Kepert's long campaign to introduce smart growth to the city's nearly half-million residents is an unquenchable belief in grassroots democracy. 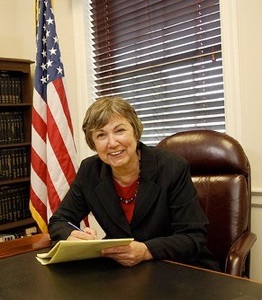 For her dedication to local planning issues and her longstanding conviction that citizens have the right to shape their own communities — a philosophy honed during 23 years teaching American history in Brookhaven public schools — Connie Kepert received the 2010 National Planning Leadership Award for a Planning Advocate. Teaching is Kepert's day job. Her second job — that of activist — began 15 years ago, when she fought an unpopular highway expansion. The thoroughfare, Middle Country Road (Route 25), bisects the hamlets of Coram Ridge and Middle Island, where Kepert and her family have long lived. By the 1990s, the road had become an ugly slash of vacant lots and abandoned stores. By some reports, it was the state's most dangerous stretch of road. When the New York State Department of Transportation wanted to turn Route 25 into a high-speed artery, Kepert launched a lobbying and education campaign to defeat the plan. She was elected president of three different community groups united in opposition to the road expansion. When no state or local power joined the fight, Kepert resorted to a strategy with long and glorious American roots — civil disobedience. She and a group of supporters painted bright yellow crosswalks across Route 25. The good natured audacity of this action had the desired effect. The road expansion was defeated, but Kepert's long campaign to save Middle Island and its neighboring villages had just begun. Following a visit by walkable communities advocate Dan Burden, she solicited funds to underwrite a three-day, public charrette that drew nearly 200 residents. Out of this was born a plan for Middle Country Road, proposing extensive traffic calming, plus the creation of two pedestrian-friendly town centers around which new stores and businesses would be developed. When the six-member Brookhaven Town Council balked at implementing this progressive plan, Kepert ran for a seat on the council. After two defeats, she was finally elected in 2005. "I always tell my students, you gotta keep trying," says the plain-talking Kepert. The following year the town council approved the Middle Country land-use plan. On the council, Kepert works in alliance with those trying to reform Brookhaven's circa-1937 zoning regulations — not an easy task on a board still dominated by the old guard. And she fights to keep the Middle Country plan moving forward. Despite fierce political battles and the economic downturn, slow progress is being made. "Being inside and learning to navigate the bureaucracy has been an education for me," she says. Michaele Weissman is a freelance writer in Chevy Chase, Maryland. Follow Connie on YouTube On Using the Positive Power of Government. Link to YouTube Or click on links below. For information on TOD click here.